For his latest work, artist Peter Mountain has used video game and digital design software to create a life-sized sculpture of a US army tank in the 20-21 courtyard. Created using a website that supplies digital objects to game designers, the piece is a virtual model in the real world. The culmination of a research period spent at Salford University’s Department of Virtual Environments, the project has taken four years to come to fruition. To bring the sculpture to life Mountain deconstructed every element of the digital model and translated it into a tangible sculptural form. The mammoth undertaking is formed from a complex jigsaw of wooden boards and pallets, which Mountain handmade himself with a CNC milling machine and took over 120 man hours to fit together. Check out the amazing time-lapse video of the tank’s construction from start to finish on our YouTube channel. 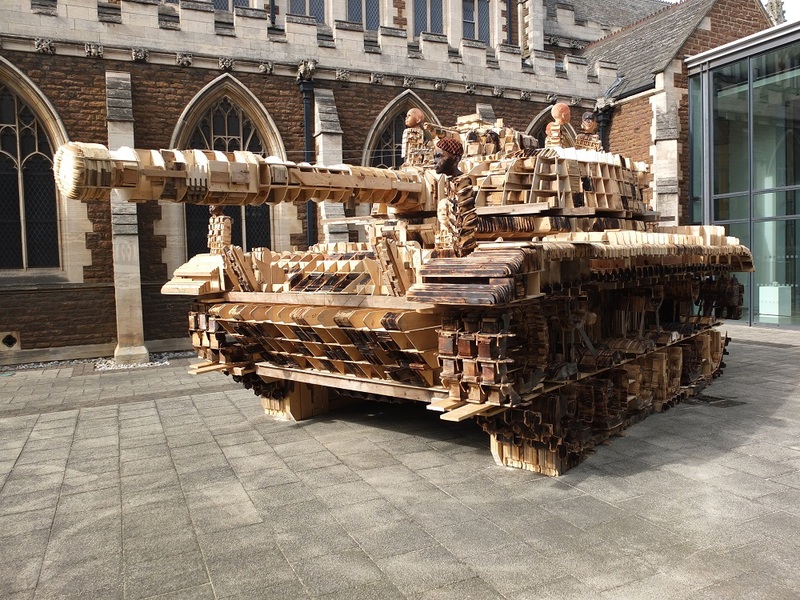 The Deconstruction and Reconstruction of an Army Tank is supported by the National Lottery through Arts Council England. To find out more about Peter Mountain’s work, visit his website.